The Vine-yl Blog: THIS WEEK ON LOST: I'M SORRY, WHAT? 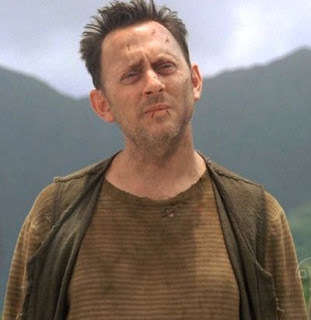 THIS WEEK ON LOST: I'M SORRY, WHAT? I think we need to start looking at Lost objectively. Let's say we're just outsiders tuning in by chance last Wednesday. So we begin watching and we see this guy, Ben, a little beat up, a little odd. He's heading into the jungle to go to a temple to be judged... by a smoke monster. He alerts the smoke monster of his presence by pulling the plug on a seriously stopped up and dirty bath tub. He then enters the temple and the smoke monster emerges from an ancient hand drier, covered in hieroglyphics. The smoke monster engulfs him in a Wizard Of Oz-esque smoke tornado in which he sees his life with his daughter pass before his eyes. And then somehow, the smoke monster deems him worthy of living. Oh yeah, and then his dead daughter comes back to life and smacks him around a bit. Okay. Strange yes, I mean I can accept it because I'm a Lost fan. I don't know why Ben is more worthy than say, Ecko, but I'm not the Island so what do I know? And please Lost writer's, did you learn nothing from Paolo and whats-her-face? We don't want any new Losties! We'll deal with a few new Dharma guys or a couple of Others. But we've had enough of plane-wrecked people on the beach. Let them find a weapons cache and have their little Lord Of The Flies moment. We don't care. "What lies in the shadow of the statue," who knows? I guess we'll find out one of these days. So, anyhew I appreciate the Ben-centric storyline, but I gotta say, it got a little weird last Wednesday. A little weird.